and always keep my eyes open for danger. 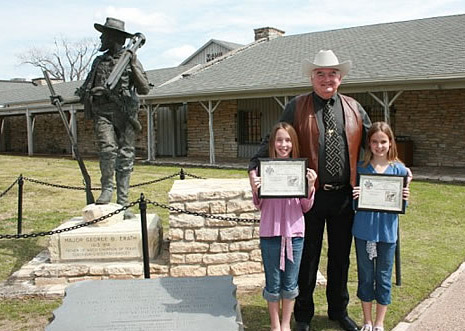 Your children can become Junior Texas Rangers® through a special program of the Texas Ranger Hall of Fame and Museum. In the 1930s, the radio programs Riding with the Texas Rangers and The Lone Ranger sponsored children's clubs that proved to be very popular. Thousands of kids and their parents joined up and received toy badges, certificates and other premiums. Decades later we still hear from senior citizens who fondly remember these clubs. In 1936, Texas celebrated the centennial of its Independence with a Texas-sized fair in Dallas. A special promotion authorized by the state allowed children visiting Texas Rangers Company "B" headquarters at the fair to become Junior Texas Rangers. This helped to brighten their lives during the Great Depression. Today, more than 70 years later, former "Junior Texas Rangers" recall with fondness their experiences riding the imaginary plains for justice. signed by an Active-Duty Texas Ranger. A Junior Ranger® Toy Badge. 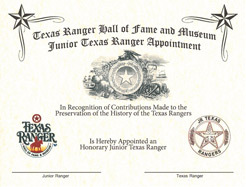 The name of your Junior Ranger® will be listed on the museum internet site and in the files of the Texas Ranger Hall of Fame and Museum. A one-time family ticket for 4 good any time at the Texas Ranger Hall of Fame and Museum in Waco. and the renovation and improvement of the museum. Please Allow Three Weeks from Receipt for Delivery. Please click here to access fun activity pages for your Junior Ranger to complete.